Most of the monthly reports released this week were stellar. 243,000 new jobs were added, and the internals, including the leading indicators of manufacturing jobs and workweek, were positive. 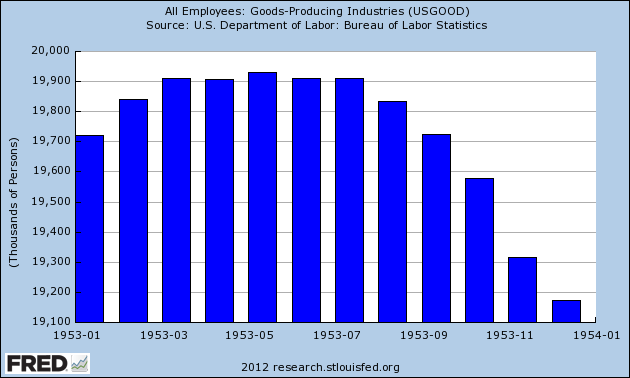 And no, as my colleague SilverOz pointed out, 1.2 million workers did not suddenly vanish. In fact, as Calculated Risk has shown, labor force participation increased 0.3% month over month. Factory orders, another leading indicator, also increased. Only consumer sentiment (of enhanced significance in the new LEI regime) fell. The ISM manufacturing index rose, and the ISM services index strongly so. The Chicago PMI fell slightly, but remained above 60. 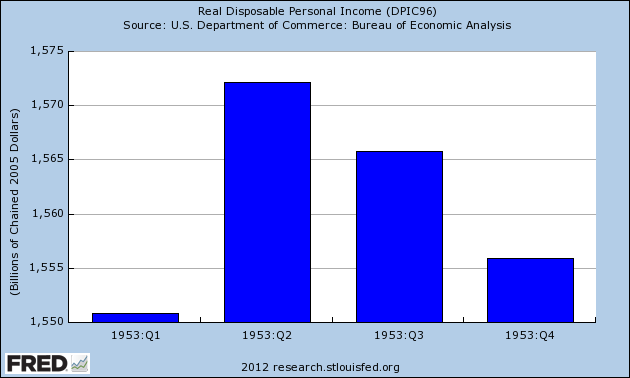 Personal income rose 0.5% while spending was flat. Auto sales reached a 3 1/2 year high. Construction spending was up. Prices of houses sold in November continued to decline. Weekly employment-related data was generally up. The BLS reported that Initial jobless claims fell by 10,000 to 367,000, the third lowest report in close to 4 years. The four week average declined by 1750 to 375,750. This too is close to the lowest level since mid-2008. The American Staffing Association Index declined by 1 to 86 last week, but remains significantly higher than last year. The Daily Treasury Statement showed that withholding for the month of January 2012, $158.7 B was collected vs. $152.9 B a year ago. Since there were only 19 reporting days this January vs. one year ago, adding in December 30 to make a 20 day vs. 20 day comparison, $169.9 B was collected this year, for a gain of 11% YoY. (Had I used February 1 instead, the comparison would have been $179.1 B this year vs. last year). The Mortgage Bankers' Association reported that seasonally adjusted purchase mortgage applications decreased 4.3% YoY and was also down -1.7% from one week ago. The overall trend remains flat since June 2010. Refinancing fell -3.6% in the last week. Mortgage applications have trended down for the last several months, although the overall flat trendline since May 2010 is still intact. For the eighth week in a row, YoY weekly median asking house prices from 54 metropolitan areas at Housing Tracker were positive, up +3.8% YoY. This is the best reading in close to 5 years. The number of metropolitan areas with YoY positive sking prices increased to 32. The number with YoY declines of greater than 5% remained at 7. The ICSC reported that same store sales for the week ending January 28 increased 3.9% YoY, and were up a slight +0.1% week over week. Shoppertrak, did not report, however, Johnson Redbook reported a 2.0% YoY gain, the weakest in 6 months. The American Association of Railroads reported mixed weekly rail traffic for the week ending January 28, 2012, with U.S. railroads originating 283,654 carloads, down 2.8 percent compared with the same week last year. Intermodal volume for the week totaled 235,028 trailers and containers, up 5.5 percent compared with the same week last year. M1 increased +0.5% last week, and +3.0% month over month. It is also up 19.0% YoY, so Real M1 is up 16.0%. This is about 5% off peak YoY gain at the end of last summer. M2 was flat week over week, and up +1.4% month over month, and up 10.1% YoY, so Real M2 was up 7.1%. This is about 3% less than its YoY reading at the crest of the tsunami. Weekly BAA commercial bond rates increased .09% to 5.29%. 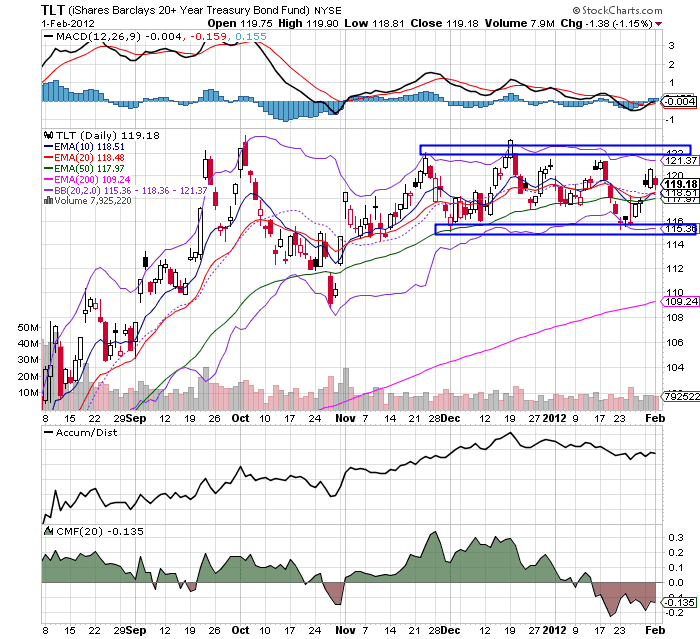 Yields on 10 year treasury bonds rose .05% to 2.01%. The credit spread between the two had a 52 week maximum difference in October but tightened slightly in the last month. Oil fell about $2 this week to close at $97.84 a barrel. This is slightly below the recession-trigger level calculated by analyst Steve Kopits (adjusted for general inflation). Gas at the pump rose $.05 to $3.44. Measured this way, we are slightly above the 2008 recession trigger level. Gasoline usage, at 7967 M gallons vs. 8549 M a year ago, was off -6.8%. The 4 week moving average is off -7.3%. Since last March the YoY comparisons have been almost uniformly negative, and substantially so since July. This week features one of the biggest declines in the 4 week average since then. 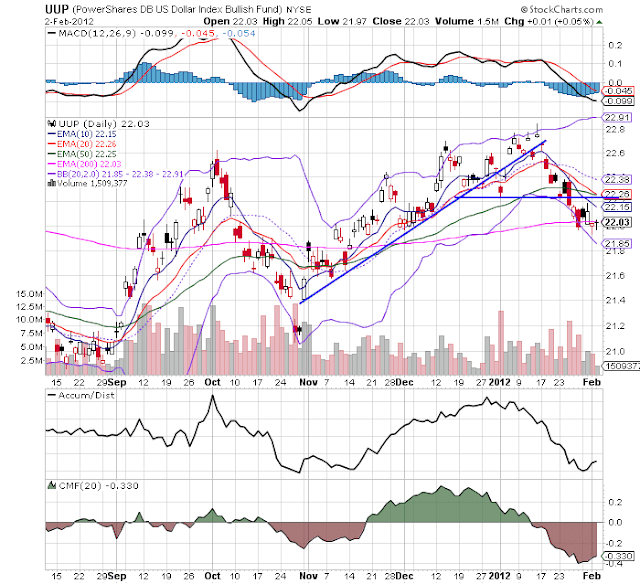 The TED spread is at 0.456 down from 0.500 week over week. This index is now back below its 2010 peak, and has declined from its 3 year peak of 5 weeks ago. The one month LIBOR is at 0.261, down .009 from one week ago, below its 12 month peak of four weeks ago, remains below its 2010 peak, and is approaching its typical level of the last 3 years. The Baltic Dry Index at 726 continued to plummet, although at a lesser rate, -79 ti 647, and drastically off its October 52 week high of 2173 (although this is nothing even remotely close to its decline during the Great Recession). The Harpex Shipping Index declined two to 392 in the last week, but is above its 52 week low of 389 four weeks ago. Please remember that these two indexes are influenced by supply as well as demand, and have generally been in a secular decline due to oversupply of ships for over half a decade. The Harpex index concentrates on container ships, and has been leading at recent tops and lagging at troughs. 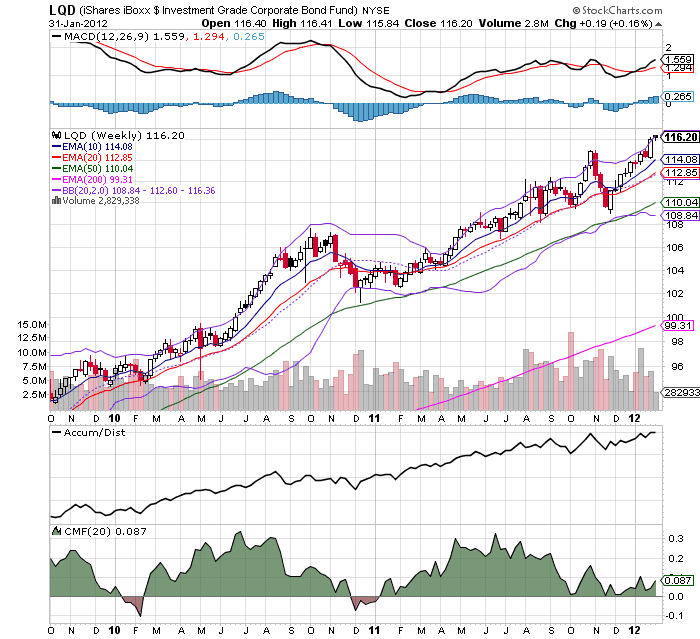 The BDI concentrates on bulk shipments such as coal and grain, and has been more lagging at the top but has turned up first at the 2009 trough. The Dow Jones Bond Index increased .10 to 116.37. The JoC-ECRI industrial metals index declined from 126.84 to 124.41, reversing most of the gain of one week before. The former is a positive, the latter a negative for the calculation of ECRI's weekly leading index. While some of the weekly reports were mixed, the big picture is that, just like one year ago, the US economy is attempting to attain escape velocity for a self-sustaining recovery. Although like one year ago the Oil choke collar remains engaged, consumer conservation and increased production are weakening its hold. Global worries have continued to abate. There remains no sign of any present or imminent downturn in the economy right now. If there is a caution flag, it remains that wages have not kept up with prices for the last year, and this is manifesting itself in consumer spending and some weakening in same store retail sales. The top chart is the YOU percentage change in PPI, which indicates prices were declining at the raw material level, although they again returned to a positive YOY comparison in December. 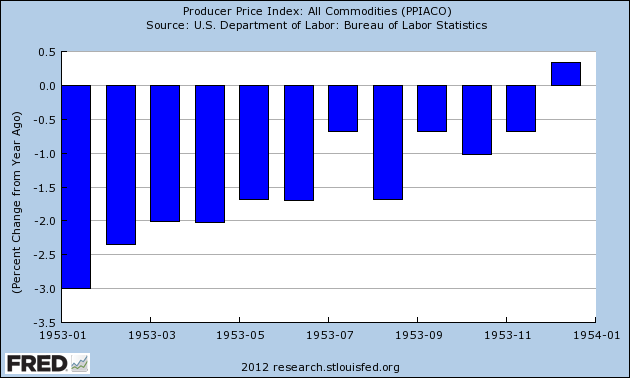 In addition, the YOY percentage change in CPI was also at very low levels, indicating price pressures were weak. 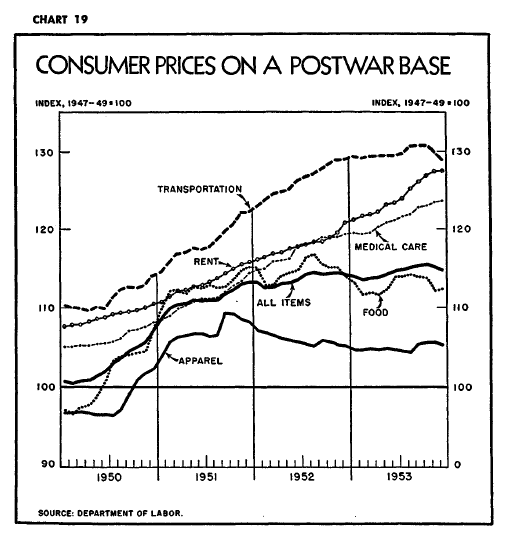 The above chart -- from the 1954 Economic Report to the President -- shows that raw material prices were on a downward trajectory for the better part of two years. 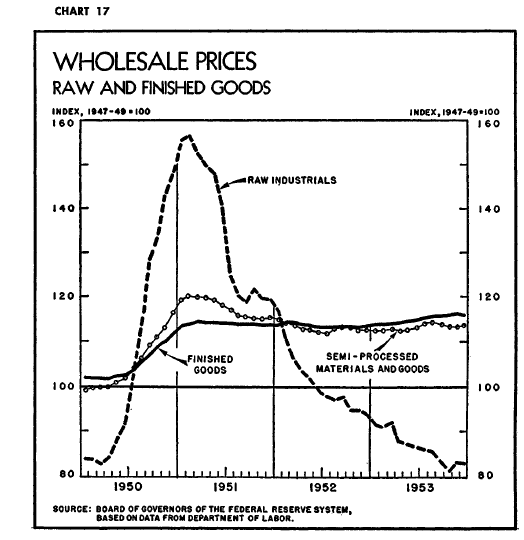 However, semi-processed and finished goods prices remained more or less constant. 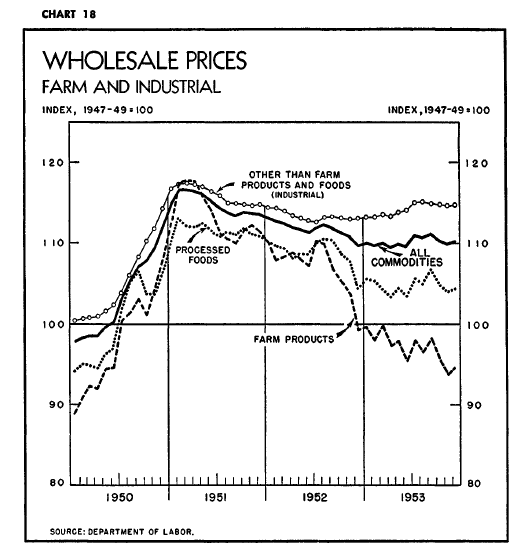 The above chart -- also from the 1954 ERP -- shows that farm prices were a primary reason for the decline in producer prices (see especially the top line of the chart). The top chart shows that residential mortgages continued advancing at strong rates, while corporations issued debt rather than borrow funds. Interest rates rose for the first half of the year in as loan demand picked-up, but fell in the later part of the year as loan demand slackened and the economy weakened. "Effective with data for January 2012, updated population estimates which reflect the results of Census2010 have been used in the household survey. Population estimates for the household survey are developed by the U.S. Census Bureau. Each year, the Census Bureau updates the estimates to reflect new information and assumptions about the growth of the population during the decade. The change in population reflected in the new estimates results from the introduction of the Census 2010 count as the new population base, adjustments for net international migration, updated vital statistics and other information, and some methodological changes in the estimation process. The vast majority of the population change, however, is due to the change in base population from Census 2000 to Census 2010. In accordance with usual practice, BLS will not revise the official household survey estimates for December 2011 and earlier months. To show the impact of the population adjustment, however, differences in selected December 2011 labor force series based on the old and new population estimates are shown in table B. The adjustment increased the estimated size of the civilian noninstitutional population in December by 1,510,000, the civilian labor force by 258,000, employment by 216,000, unemployment by 42,000, and persons not in the labor force by 1,252,000. Although the total unemployment rate was unaffected, the labor force participation rate and the employment-population ratio were each reduced by 0.3 percentage point. This was because the population increase was primarily among persons 55 and older and, to a lesser degree, persons 16 to 24 years of age. Both these age groups have lower levels of labor force participation than the general population." So Rick/Zero Hedge, unless you would like to argue that the population of the United States also grew by 1.5 million in one month (since that is from the exact same report/revision you quoted), I think both of you should retract your extremely misleading statements about those not in the labor force increasing by over a million in January and simply admit that you are either too stupid or too focused on selling a particular world view to read the data correctly. At the very least, a reputable financial news organization like CNBC needs to set the record straight on data like this as while Mr. Santelli is entitled to his own opinion, he is not entitled to his own facts, and the fact is 1 million people did not drop out of the labor force in January 2012. The change in total nonfarm payroll employment for November was revised from +100,000 to +157,000, and the change for December was revised from +200,000 to +203,000. Monthly revisions result from additional sample reports and the monthly recalculation of seasonal factors. The annual benchmark process also contributed to these revisions. I'll let the report speak for itself --but the above is also great news. Total nonfarm payroll employment rose by 243,000 in January, and the unemployment rate decreased to 8.3 percent, the U.S. Bureau of Labor Statistics reported today. Job growth was widespread in the private sector, with large employment gains in professional and business services, leisure and hospitality, and manufacturing. 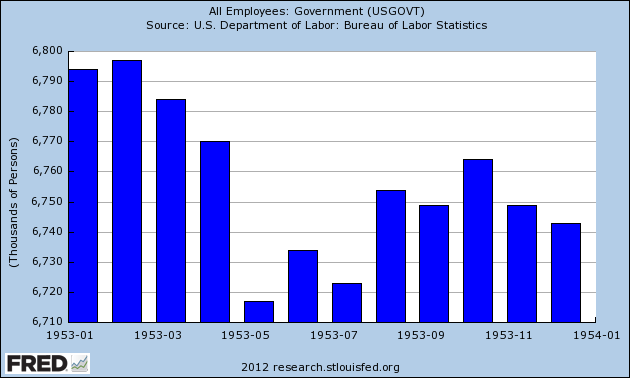 Government employment changed little over the month. First -- those are some very nice headline numbers. Let's look at the details"
Professional and business services continued to add jobs in January (+70,000). 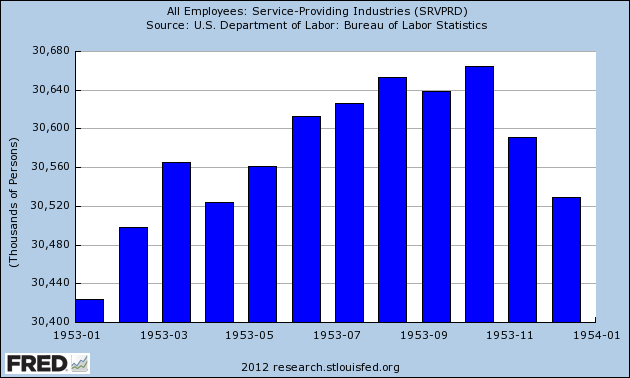 About half of the increase occurred in employment services (+33,000). Job gains also occurred in accounting and bookkeeping (+13,000) and in architectural and engineering services (+7,000). Over the month, employment in leisure and hospitality increased by 44,000, primarily in food services and drinking places (+33,000). Since a recent low in February 2010, food services has added 487,000 jobs. In January, health care employment continued to grow (+31,000). Within the industry, hospitals and ambulatory care services each added 13,000 jobs. Wholesale trade employment increased by 14,000 over the month. Since a recent employment low in May 2010, wholesale trade has added 144,000 jobs. Employment in retail trade continued to trend up in January. Job gains in department stores (+19,000), health and personal care stores (+7,000), and automobile dealers (+7,000) were partially offset by losses in clothing and clothing accessory stores (-14,000). Since an employment trough in December 2009, retail trade has added 390,000 jobs. In January, employment in information declined by 13,000, including a loss of 8,000 jobs in the motion picture and sound recording industry. In the goods-producing sector, manufacturing added 50,000 jobs. Nearly all of the increase occurred in durable goods manufacturing, with job growth in fabricated metal products (+11,000), machinery (+11,000), and motor vehicles and parts (+8,000). Durable goods manufacturing has added 418,000 jobs over the past 2 years. Employment in construction increased by 21,000 in January, following a gain of 31,000 in the previous month. Over the past 2 months, nonresidential specialty trade contractors added 30,000 jobs. Mining added 10,000 jobs in January, with most of the gain in support activities for mining (+8,000). Since a recent low in October 2009, mining employment has expanded by 172,000. Government employment changed little in January. Over the past 12 months, the sector has lost 276,000 jobs, with declines in local government; state government, excluding education; and the U.S. Postal Service. The gains are widespread -- a very positive development, as it indicates the economy is starting hit on all cylinders. Short version 7.5 on a scale of 10. Good news all around. NDD here with a few observations as well. - manufacturing employment up 50,000! These are great internals and exactly what we want to see. The only negative is that the report still isn't good enough to make a serious dent in the number of jobs we need to recover to 2007 levels on a population adjusted basis -- for that we need over 300,000 a month. The above three charts illustrate the importance of looking at all the equity markets. 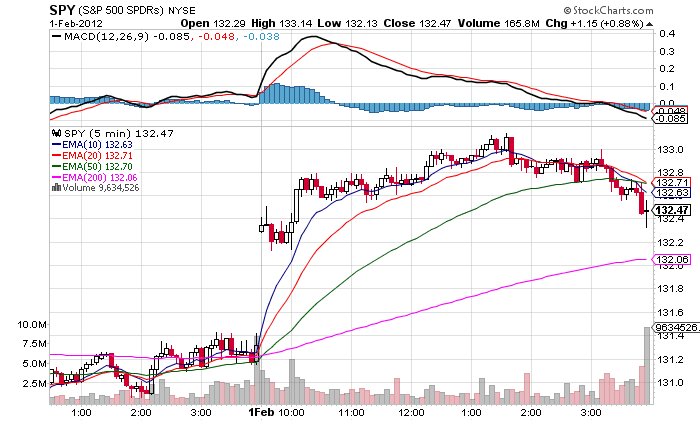 The top chart (the SPYs) 60 minute chart could lead to the conclusion that stocks are losing their upward momentum. However, the bottom two charts (the NASDAQ and Russell 2000) show prices moving above previously established highs. This gives us an indication we'll probably see prices continue to move higher, as the IWMs and QQQs are the riskier averages. 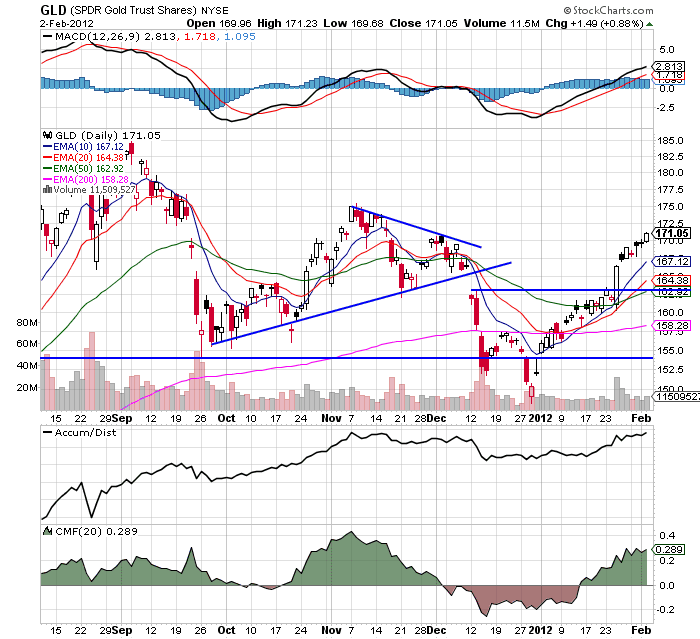 Gold is still in a rally. Prices have advanced through the 102 level (which they did when the Fed announced its long-term interest rate decision) and have continued to move higher. All the shorter EMAs are advancing with the shorter above the longer. 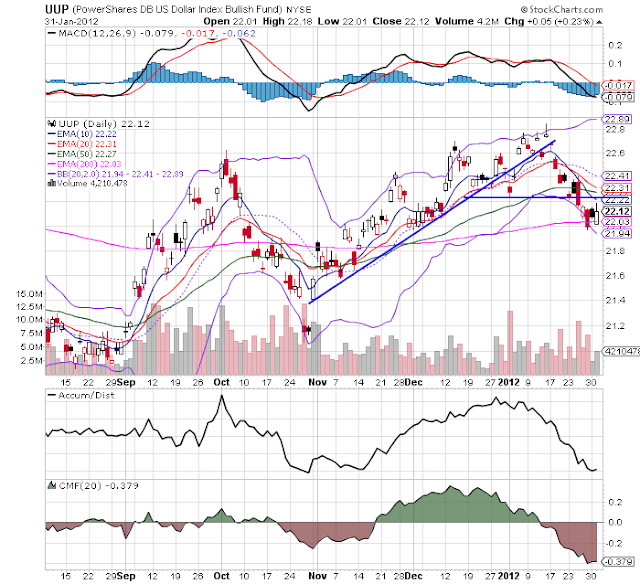 The MACD is also very bullish. 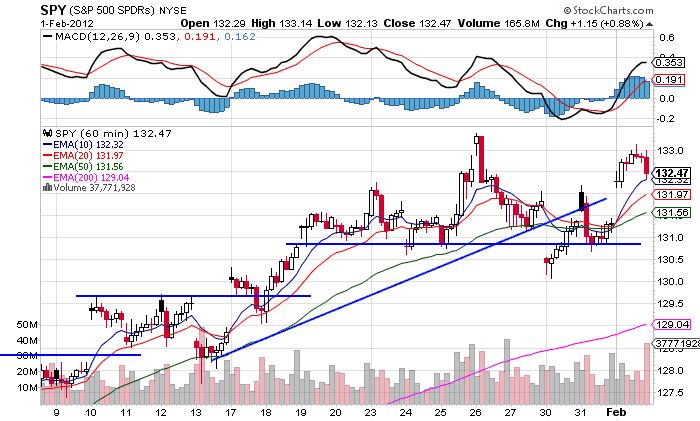 The dollar -- while still moving lower -- is finding support at the 200 day EMA. However, don't expect this level to hold; the Fed's decision is long-term dollar negative and the euro is catching a bid. The recession that started mid-year was (obviously) a very negative development for employment. However, the unemployment rate didn't start moving higher until the fourth quarter, with a big spike in both November and December. The big reason for the drop is the huge cratering of goods-producing jobs, which declined by more than 700,000 over the course of the year. 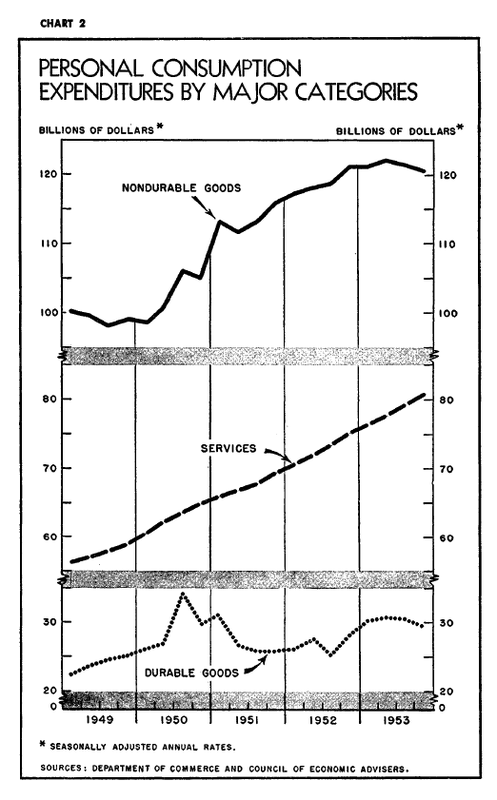 Service producing industries followed s somewhat different trajectory. First, we see increases from January until October, but a pretty sharp drop in November and December. 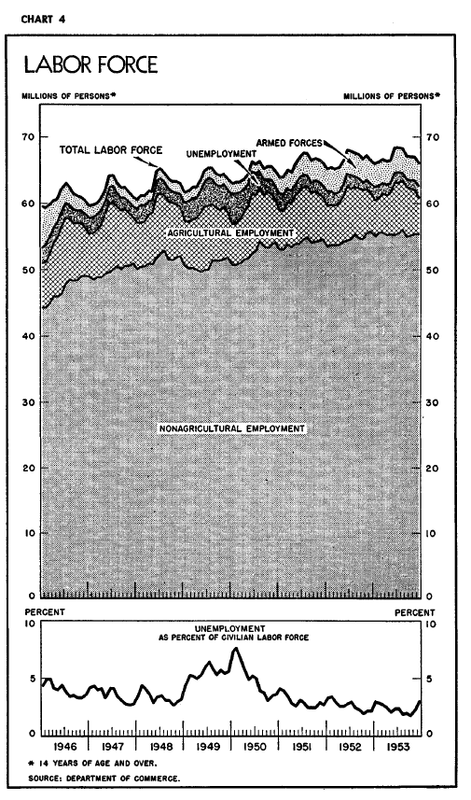 And overall, we see a drop in government employment, largely as a result of the drop in defense spending related to the Korean war cease-fire. 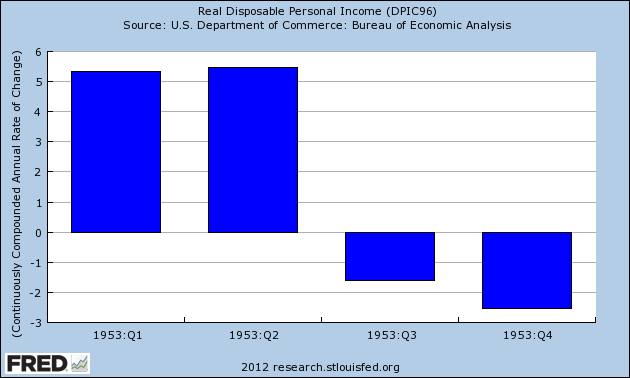 As a result of the weakening employment picture, real DPI took a hit. Which we all see in absolute values above. The two primary proponents of the view that a new recession is beginning have been ECRI and John Hussman. As of now, we can say that Hussman's own metric invalidates his recession call, and that ECRI's initial recession call was also inaccurate. While I have great respect for ECRI, when they made their initial recession call in September 2011, I wondered if they had misinterpreted a transient if violent downturn in manufacturing and consumer confidence, due mainly to the debt ceiling debacle and the consequent downgrading of US bonds, for typical short term leading indicators of recession. We can now say that it indeed appears to have been the case. "We may be in a recession today already, or it may start in the next month or two." 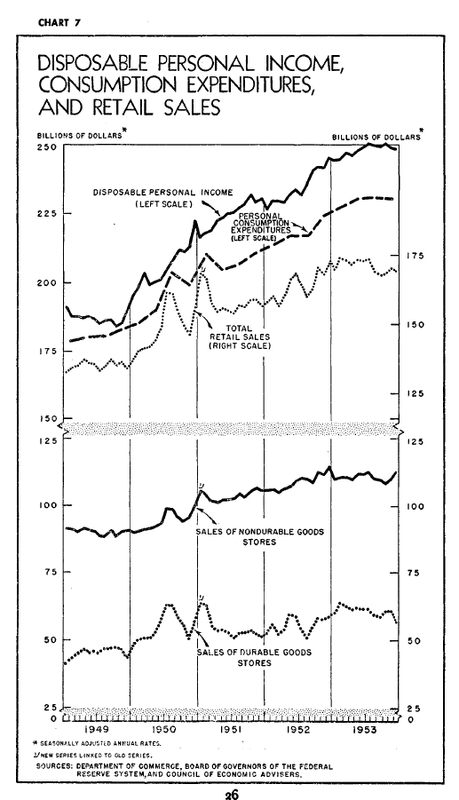 Achuthan also made it clear that he was relying not on GDP, but rather on the traditional NBER standards for determining a recession: industrial production, payrolls, real retail sales, and real personal income. All four finished 2011 at post recession highs. While certainly revisions to data are frequent, it will take some serious revising to cause enough of this data to turn negative to claim that a recession did begin by the end of last year. While subsequently ECRI backtracked and has revised the call to say a recession will begin by the end of June, their initial call must be regarded as busted. 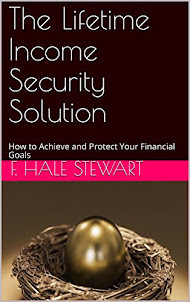 the composite of economic and financial evidence we presently observe has always and only been associated with ongoing or immediately impending recessions. This is not an opinion or a viewpoint, but a fact of the data. "Always and only" is the Bayesian equivalent of "certainty"
NDD comment: this component is still in effect, as credit spreads have not significantly improved since falling in August, but this condition may be violated in about six weeks if there is no further deterioration. NDD comment: This condition has been violated as of one week ago. The S&P 500 is higher now than it was 6 months ago, and yesterday came within a hair of a 6 month high. 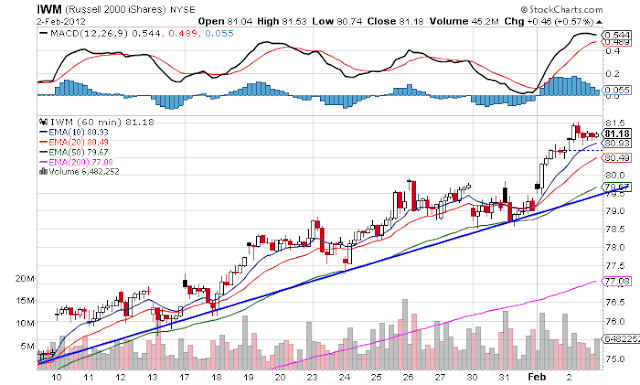 NDD comment: This condition has also been violated as of the January ISM report of 54.1. If January nonfarm payrolls exceed 122,000, there will be a second violation as payroll growth will be more than 1.3% YoY. The unemployment rate has fallen by 1/2% in the last half year. NDD comment: This condition is still in effect. 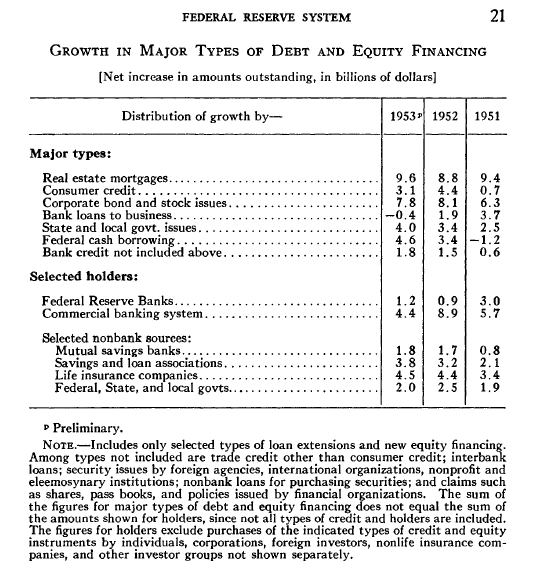 Of course, it was also in effect during most of the 1930's 10% YoY New Deal expansion, the entire 1940's, and the start of the 1950's -- coinciding with the strongest growth of the last 100 years. Now, it's possible that there are differing levels for these 4 metrics signaling "recovery" for Hussman vs. their "recession" signals as claimed above, but if so Hussman should explain what those different recovery levels are. Otherwise, as of now, two of the four necessary metrics metrics making up his composite based on which he predicted an "imminent recesson" 6 months ago have been violated. Thus the original basis for his recession warning is also no longer valid. As for the immediate future, the simple question is: can you really have a recession when housing (permits close to 3 year highs) and cars (sales at 3 1/2 year highs) won't play along? On a related note, this morning's initial jobless claims number of 367,000 was the first week not affected by seasonality, and tells us that the recent drop was very real. If the relationship between initial jobless claims numbers and payrolls for this recovery continues to hold, then we should expect January's payrolls report tomorrow to be similar to December's number -- generally, somewhere in the vicinity of +200,000. Over the last few trading days, I've been watching the market very closely, looking for cracks in the rally. While prices have been moving sideways for that time, there have been no strong downward moves, indicating we were in a period of consolidation. This highlights the reason it's important to look at the market in multiple time frames; this wasn't as apparent on the daily time frame. 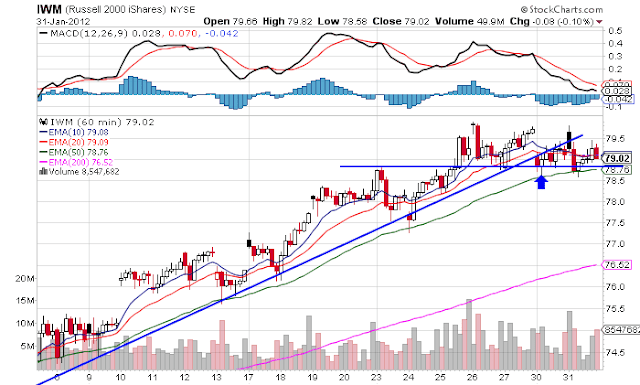 This is the chart that really highlighted the situation. 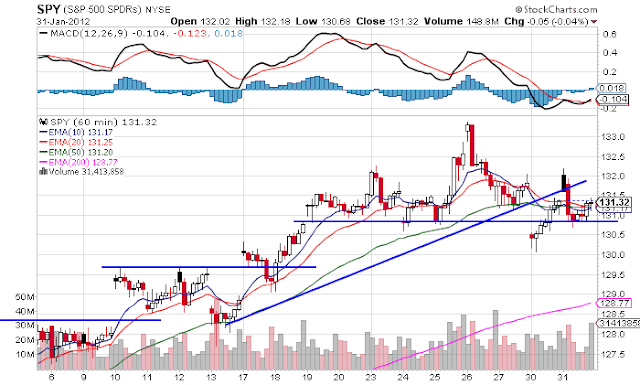 Notice how prices were finding support at around the 131 area. The fact prices weren't moving through this level was, to me, very telling, as it indicated traders had a series of open buy orders around this level. Yesterday, we see prices gap higher at the open. 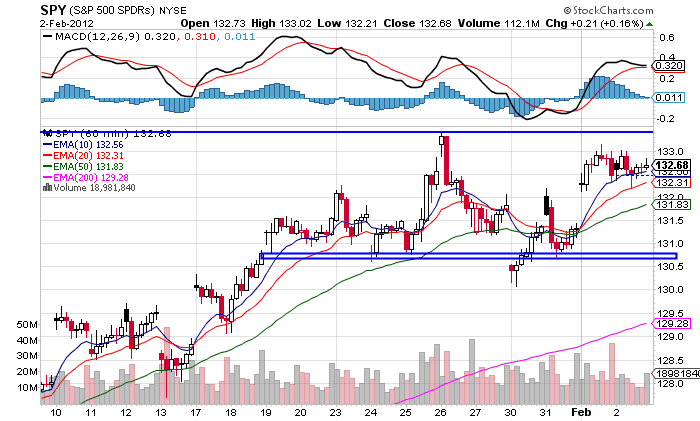 However, we don't see them advance beyond the 133/134 level, telling us there is still resistance at this level. Again, the daily chart highlights the current situation in the detail we need. 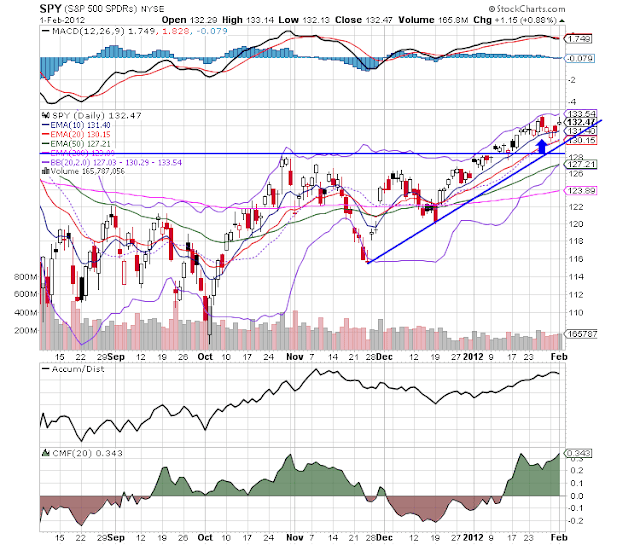 The arrow is pointing to recent price action. We see a cluster of bars around the 130/132 level, but no strong move above that level. 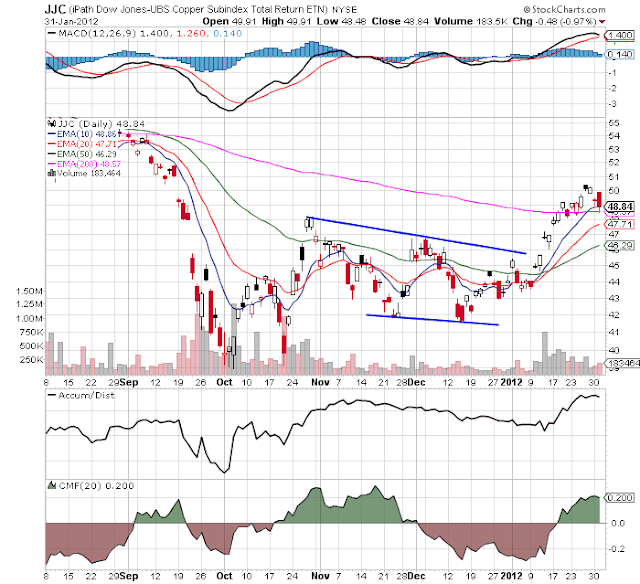 However, while we see strong volume indicators (A/D and CMF), we also see the MACD giving a sell signal. At minimum, this tells us to keep a watchful eye on the upside resistance areas/level (right around the 133.5 level). The one negative with yesterday's price action is it more or less formed an upside down saucer formation with a sell-off near the end of trading on heavier volume. 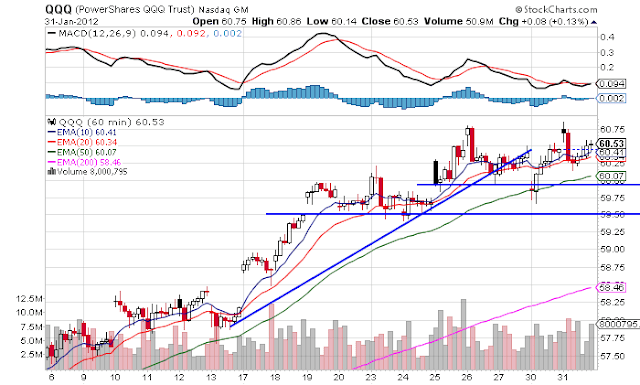 The long-end of the treasury curve is in a tight range with low volatility. 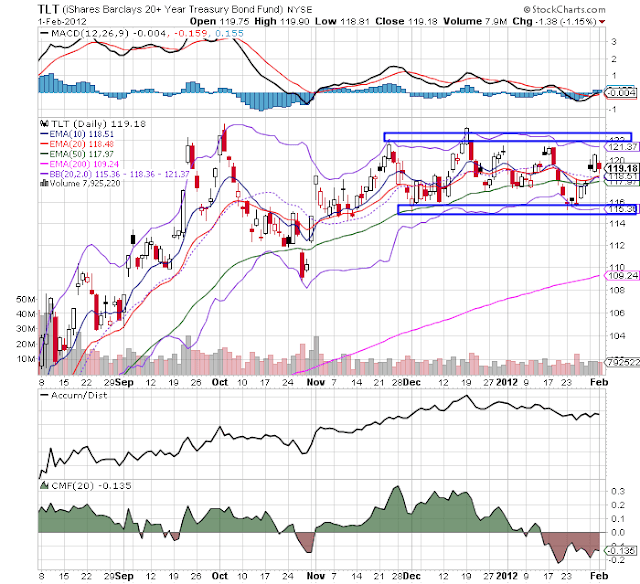 I don't see much chance for an upside break-out, given the lower yield that would occur. So, keep you eyes open for the 116 price handle. 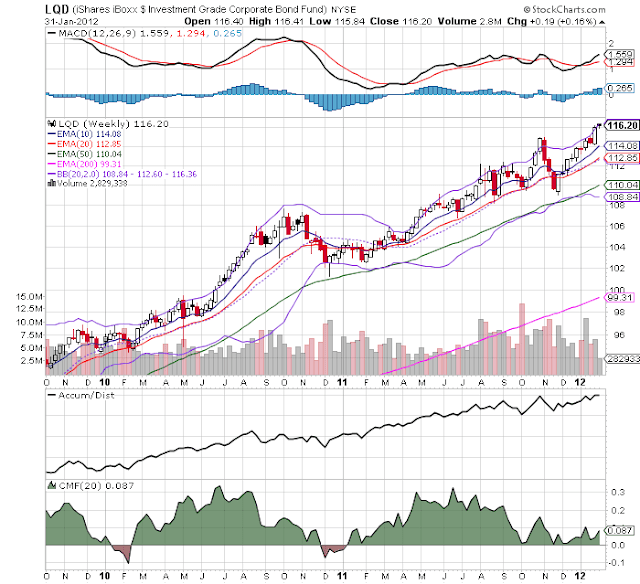 Industrial metals have consolidated recent gains around the 200 day EMA. 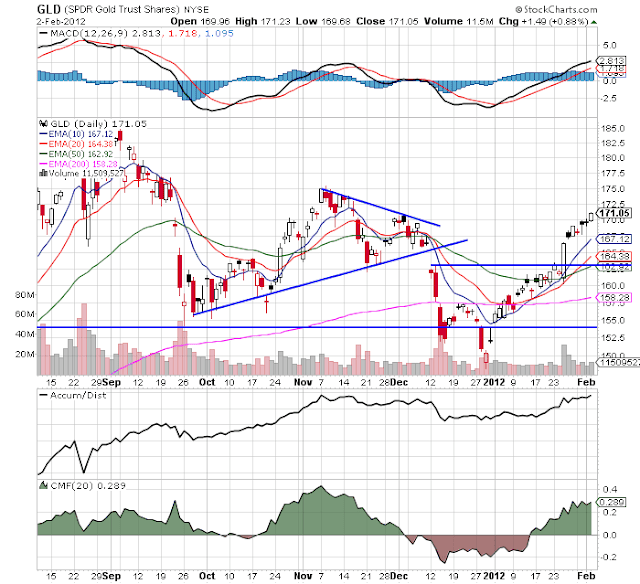 The shorter EMAs and volume indicators are still bullish, but the MACD is headed to a sell-signal. If the issuance of treasury securities were creating a problem for private companies, the above charts (the top for junk bonds, the bottom of high grade corporate bonds) would be the exact opposite -- they'd both be heading south. 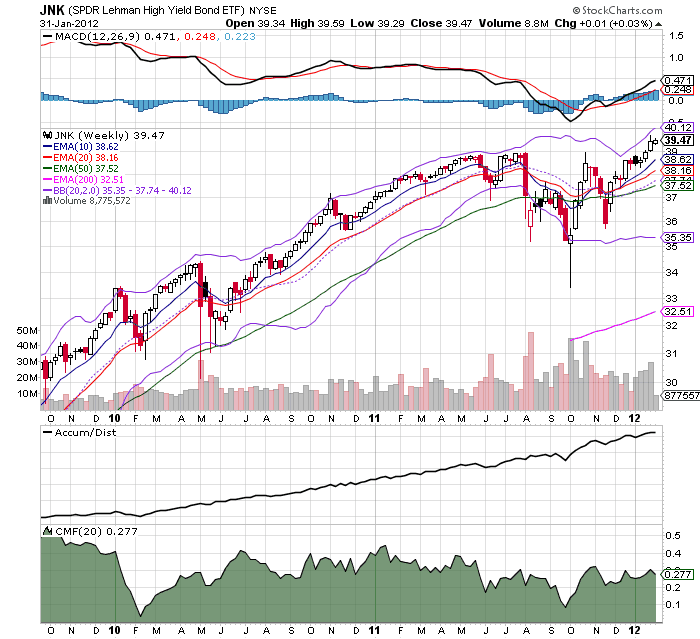 However, we're seeing a rally in both sectors, telling as there is ample private demand for these securities. That probably has something to do with record low interest rates in the treasury market, which means investors will be looking for higher yielding assets. The above chart shows the dual nature of 1953's investment picture. In the 1Q, overall investment added 1.2% to overall GDP growth, with equipment and software accounting for the lions share of the investment. However, even in the first quarter, we see that inventory investment subtracted a fair amount from growth. 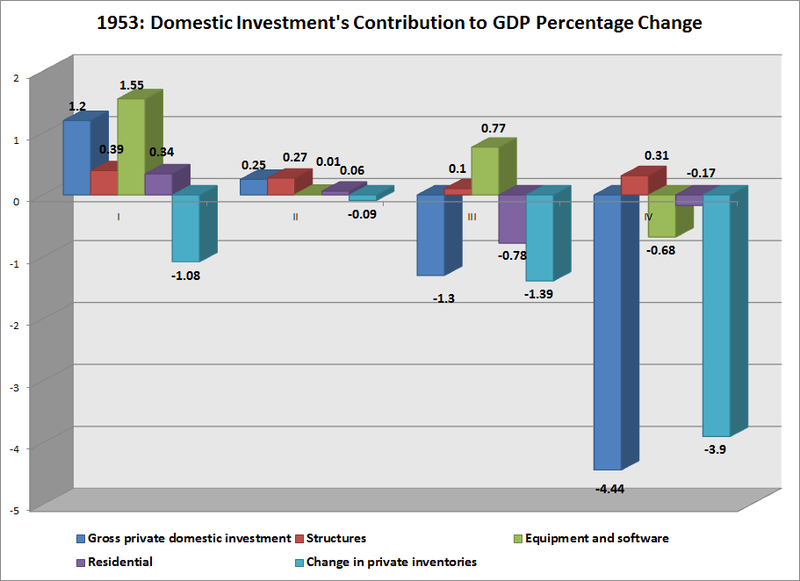 This trend became far more pronounced by the end of the year, when the inventory contraction accounted for a large drop in the overall contribution of investments to GDP growth. After midyear the pace of economic activity slackened appreciably as business buying for inventory dropped sharply and as fresh expansive forces were lacking. At this time reductions in defense spending came to be more widely anticipated. A truce in Korea was agreed to in July, and international tensions appeared to be easing somewhat. Business concerns and the armed services reduced new ordering and, with new orders below shipments, unfilled orders declined sharply from earlier high levels. Reflecting the effect of reduced output accompanying these developments, the buildup of business inventories, which had been at a seasonally adjusted annual rate of 6 billion dollars in the second quarter, was considerably retarded in the third quarter and turned into moderate liquidation in the fourth quarter. 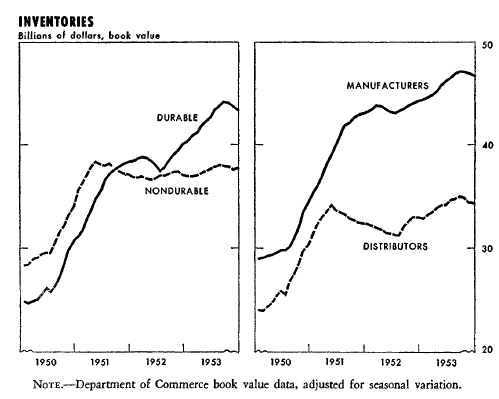 At that time, as the chart shows, stocks were being reduced by both manufacturers and distributors. The principal reductions were in stocks of durable goods, which earlier had advanced most. 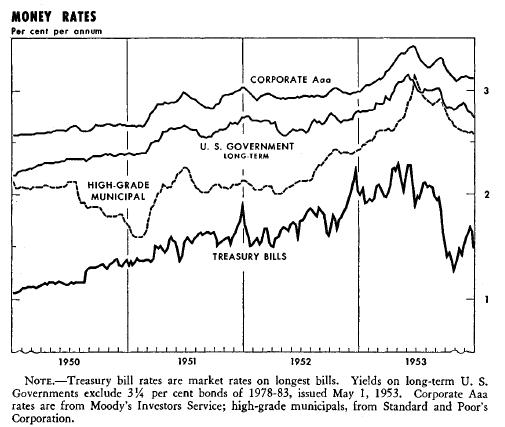 I'll explain the recession that started mid-1953 in more detail later. However, as production dropped from the drop in war spending, we also see a drop in consumer purchases of heavier items (cars and furniture/household goods). 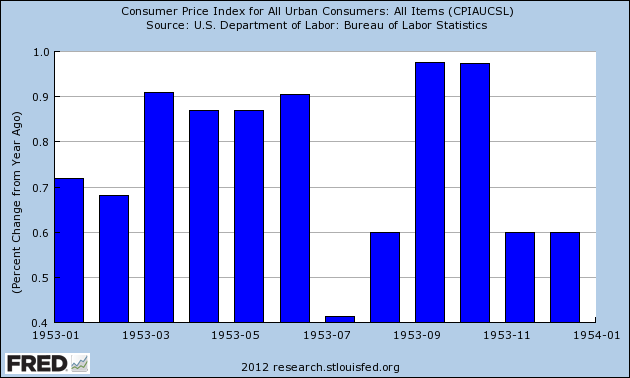 Hence, the economy was hit by a double-whammy of declining consumer and government demand. 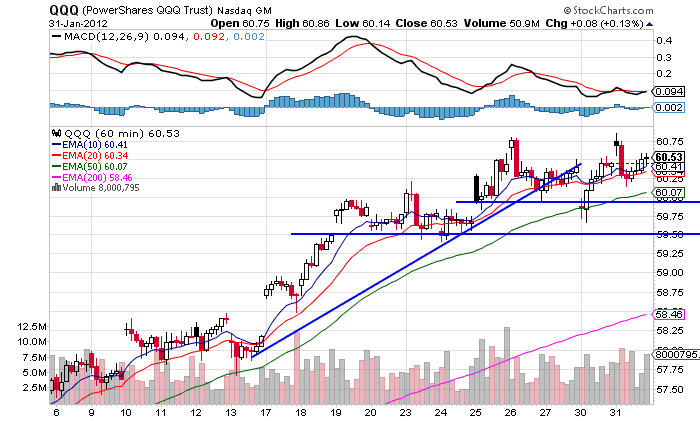 Remember: what we're looking/waiting for in the equity markets is a move through support. So far, all, we've gotten in terms of price action is sideways movement, indicating the selling pressure isn't there -- at least, not yet. 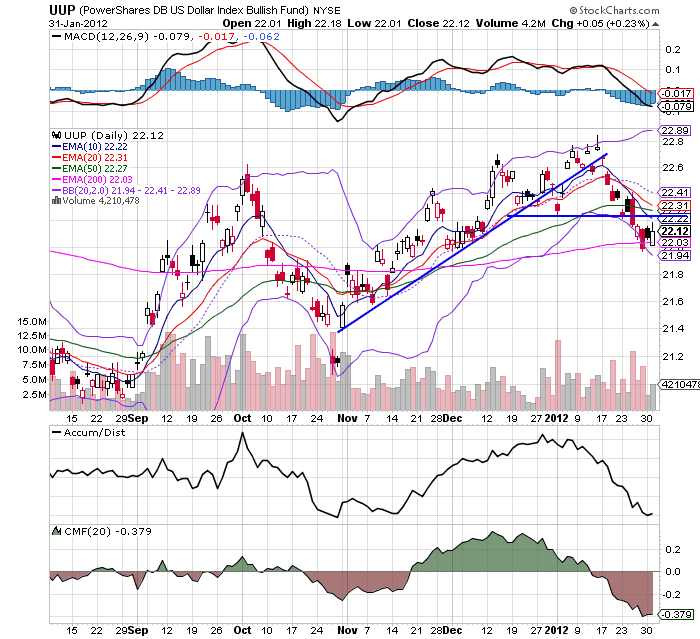 Copper is still rallying. 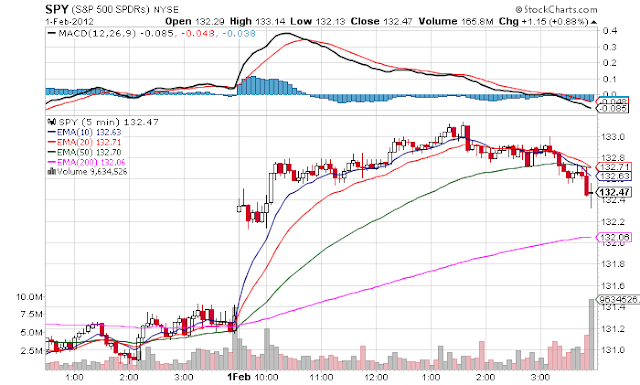 Prices have moved higher, the volume indicators show new money coming into the market and the MACD is still positive. However, the MACD is also near to giving us a sell signal, which will become more important if we see prices move through technical support -- especially the 200 day EMA. 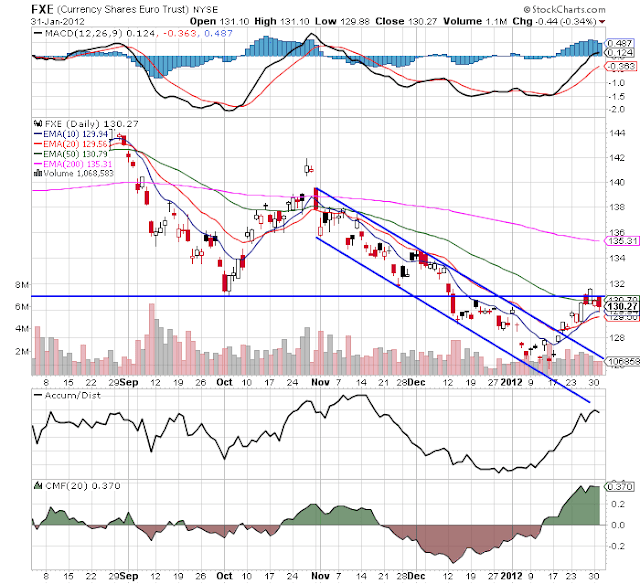 The euro have broken through the upper trend line of its downward sloping channel, and is now hitting resistance at the early October lows. 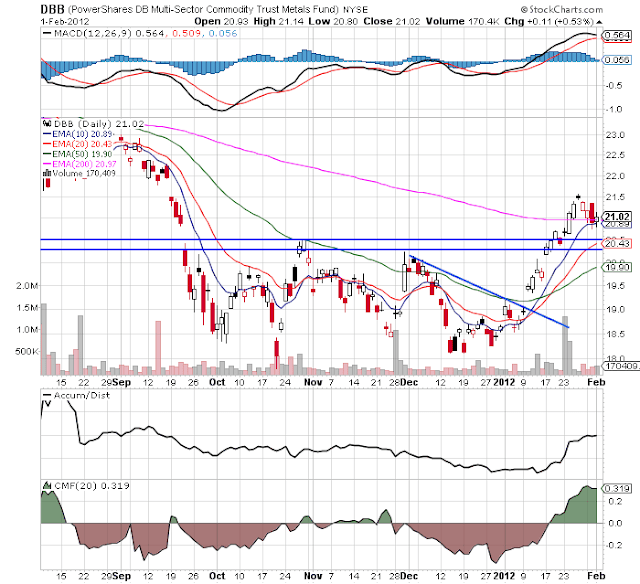 The shorter term EMAs (the 10 and 20) are both rising, momentum is positive and money is flowing into the market. 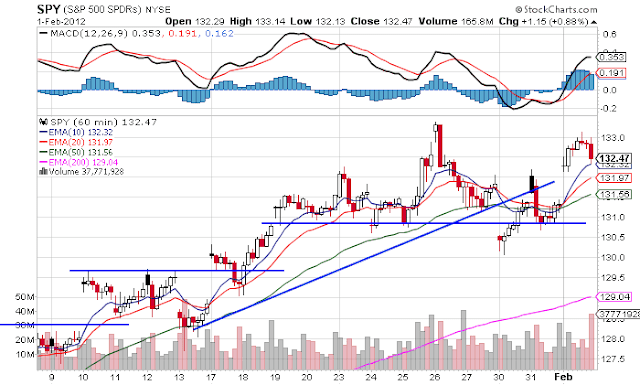 A move through the 131 area would give us a new price target of 135.3 (the 200 day EMA). In contrast to the euro, we have the dollar, which is now clearly in a downtrend. 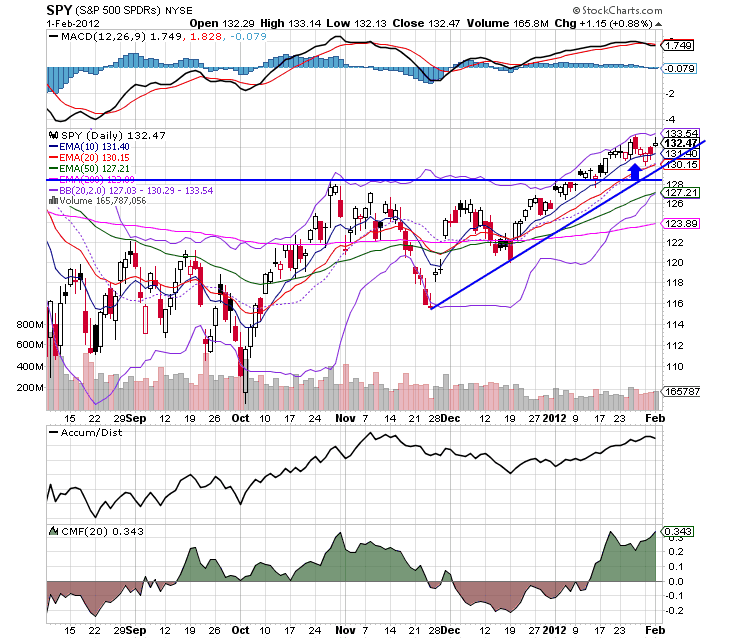 Prices are right at the 200 day EMA, but there are numerous, bearish indicators. The shorter EMAs are moving lower, the CMF and A/D are printing negatively, and momentum is down. Regarding business loans, domestic banks reported, on balance, little change in standards on commercial and industrial (C&I) loans but a continued easing of pricing terms on such loans during the fourth quarter. Domestic banks reportedly experienced stronger demand for C&I loans from firms of all sizes on net. The net fraction of banks reporting increased demand from small firms rose to its highest level since 2005.3 Foreign respondents reported having tightened both standards and terms on C&I loans, on net, and they indicated that loan demand had been about unchanged over the past three months. Domestic banks continued to report little change in their standards for CRE loans, but modest net fractions had eased some loan terms over the past year. Moderate net fractions of domestic banks reported that demand for CRE loans had strengthened in the fourth quarter. Modest net fractions of foreign respondents reported having tightened standards for CRE loans. Foreign respondents also reported, on balance, little change in demand for such loans. On the household side, lending standards and demand for loans to purchase residential real estate were reportedly little changed over the fourth quarter on net. Standards on home equity lines of credit (HELOCs) were about unchanged, while demand for such loans weakened on balance. Moderate net fractions of banks reported that they had eased standards on all types of consumer loans over the past three months, and some banks also eased terms on auto loans. Demand for credit card and auto loans reportedly had increased somewhat, while demand for other types of consumer loans was about unchanged. 1953 is a year with two sub-parts. The first two quarters we see decent growth. In the first quarter, the growth is pretty even, spread among durable, non-durable and service purchases. In the second quarter, we see a slight drop in durable good purchases. In the third quarter, non-durable goods purchases subtracted sharply from growth, while durable goods and lack of service purchases were the reason for the drop in the fourth quarter. 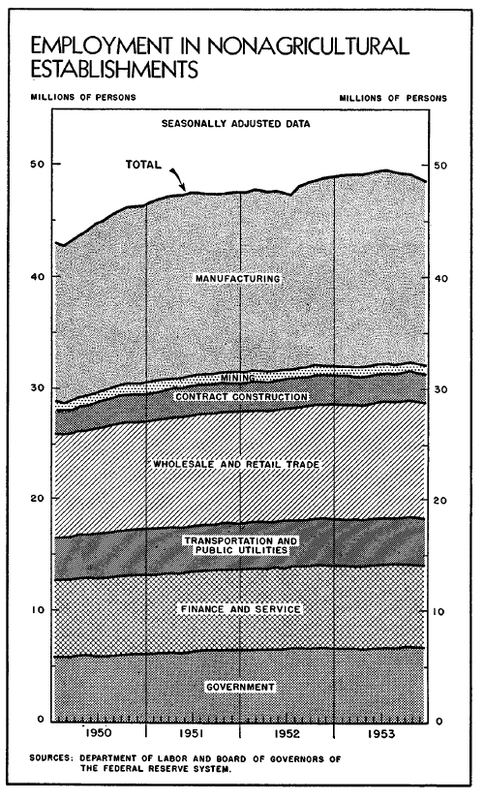 The above chart is fascinating, as it puts PCEs in perspective for the early 1950s expansion. Overall durable goods purchases remained fairly constant, coming in between $25 and $30 billion. However, service purchases continued to increase, moving up constantly for the entire expansion. 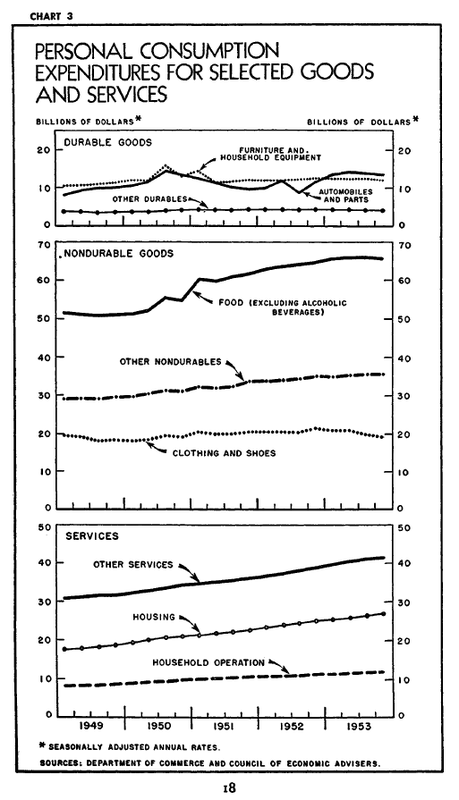 Non-durables topped-off in 1953 and moved slightly lower in 3Q53 and 4Q53. 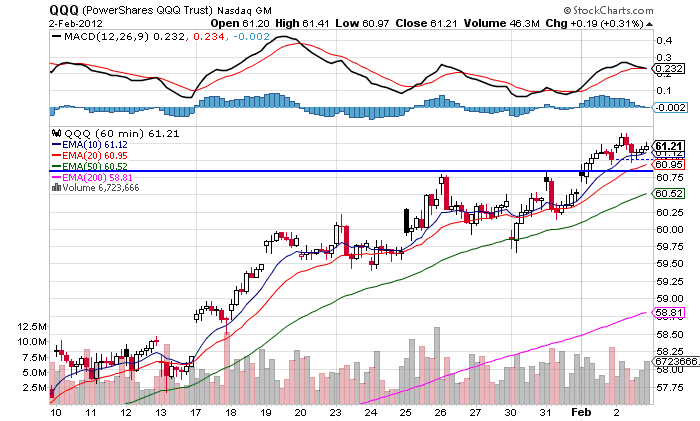 The above chart chart places the preceding observation into more detail. This expansion was about autos and homes, as evidenced by the purchases of autos and furniture. Also note how housing services continued to rise. 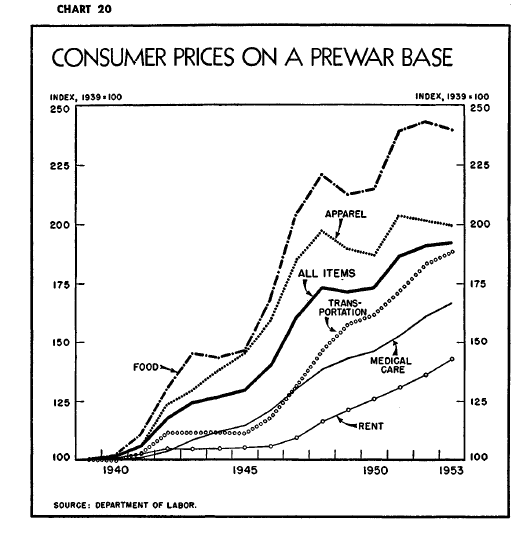 Finally, food purchases saw strong gains, probably because we were still dealing with a culture that was getting away from war rationing. 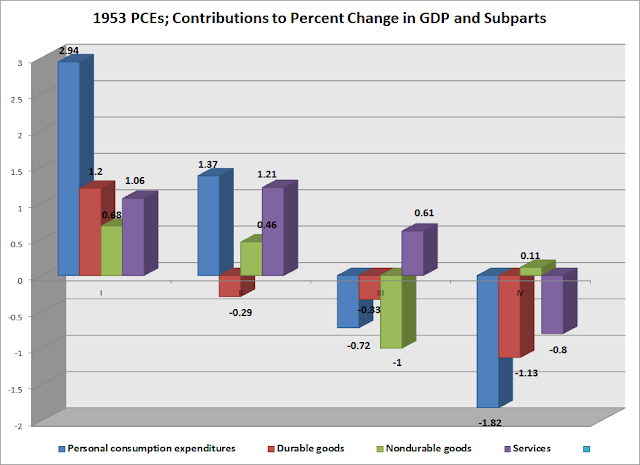 The above chart of various consumer goods outputs really highlights the extent of the growth in consumer spending. In 1950, we made 3 million TVs. 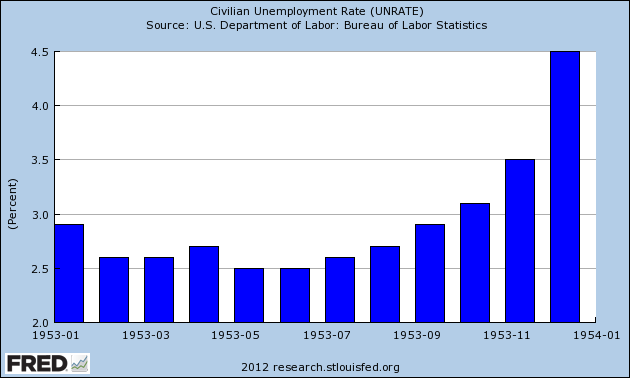 That number nearly doubled by 1953. Air conditioner output increased by a factor of 10! Clothes dryer output doubled. This was the consumer on steroids. A Closer Look At Manufacturing. Morning Market: Is The Rally Over?